We have added x2,075 screencaps of Ella in Wildlike to the gallery. If you haven’t already seen the movie, you must – its great and Ella performance is fantastic! Ahead of its US release in just over three week,s a new trailer has arrived online for writer-director Frank Hall Green’s upcoming thriller Wildlike which stars Bruce Greenwood and Ella Purnell. Screencaps to follow! 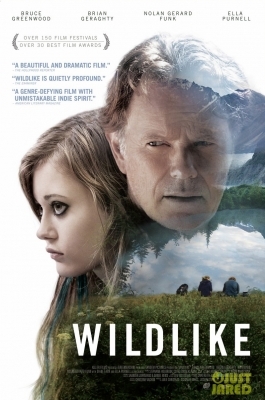 Ella Purnell and her co-star Bruce Greenwood are featured on the poster for their new film Wildlike. The movie will debut in theaters and on demand on September 25. Horray! The Richmond International Film Festival is proud to be screening the first feature film from Frank Hall Green. “I knew my first feature would be set in the outdoors,” understates Frank Hall Green, whose film, Wildlike, covers an immense amount of ground. Like, actual ground. Intensely beautiful, sweeping, lush yet stark vistas of ground. Green and his wife took a trip to Denali in 2003, and they could never quite get it out of their heads. After successfully establishing himself in show biz as a producer and writer and short-film director, it didn’t take long for Green to decide exactly what piece of outdoors he wanted his first feature film to inhabit. Wildlike‘s protagonist, Mackenzie (played by Ella Purnell) is, for all intense and purposes, unloaded onto an uncle who lives in Alaska. She’s a vulnerable 14-year-old with a newly dead father, her mom’s in some sort of mysterious and vaguely selfish-seeming treatment in Seattle, and she’s basically got no one in her corner. Disappointingly, her uncle takes advantage of this situation. And in an especially tense scene in a particularly beautiful setting, Mackenzie gets the hell out of Dodge. “The story of someone running into the outdoors and finding something there. I kind of put all the pieces together right at the same time. This is something she can run from and somewhere she can run to,” says Green. Ella Purnell was 15 when she began filming. Her tendency to chew on her sleeves while her enormous eyes avoid contact is so perfectly troubled teenage girl that, if you’ve been a teenage girl yourself, you immediately recognize and unearth the discomfort, the anger, and the confusion you felt when you realized that adults sure know how to let someone down. Green had auditioned a number of Disney and Nickelodeon actresses for the part, and nothing really clicked. They were too polished, and he knew the role required something more raw. He came back to his hotel room after a round of auditions in Los Angeles and caught some of Mark Romanek’s Never Let Me Go, in which Purnell plays Keira Knightley’s character’s younger self. Green had one of those “That’s it! That’s my Mackenzie!” moments that you see in films about filmmaking, and shortly thereafter, the actress was on board. We have added x43 screencaps of Ella in the film Wildlike, as soon as its released on DVD&Bluray we will get it capped also. We are yet to see the film, but can;t wait to! Check out the trailer, here. Although this isn’t an interview with Ella, its a great read, all about her movie Wildlike. “I’m an avid backpacker and love the outdoors, so I wanted to tell a story about a journey in the wilderness and, I think I subconsciously really wanted to tell a story about the healing power of nature,” “Wildlike” writer, producer, and director Frank Hall Green told Hamptons.com when we sat down with him and “Wildlike” actor Nolan Gerard Funk during the Hamptons International Film Festival (HIFF). “In addition to that, there’s a social issue component which is important to me,” noted the director. “It’s very loud in its quietness,” Funk explained. The actor, who’s had roles in “Glee,” MTV’s “Awkward,” “The Canyons,” and “Riddick,” told us while he doesn’t have as much backpacking experience as Green, he thinks each character represents a different piece of the director. “He wrote the film, so there’s a part of him in all of us,” said Funk, who plays one of the backpackers Mackenzie meets along the way. Woodstock Film Festival on Thursday, October 16 and Saturday, October 18. Austin Film Festival on Friday, October 24 and Sunday, October 26! Indie Memphis Film Festival on Friday, October 31!